Dreaming of an outdoor wedding venue filled with cozy romance of the dreamiest kind? Here are four South Tahoe locations that put the ice-ing on the cake. There’s just something so romantic about a winter wedding. 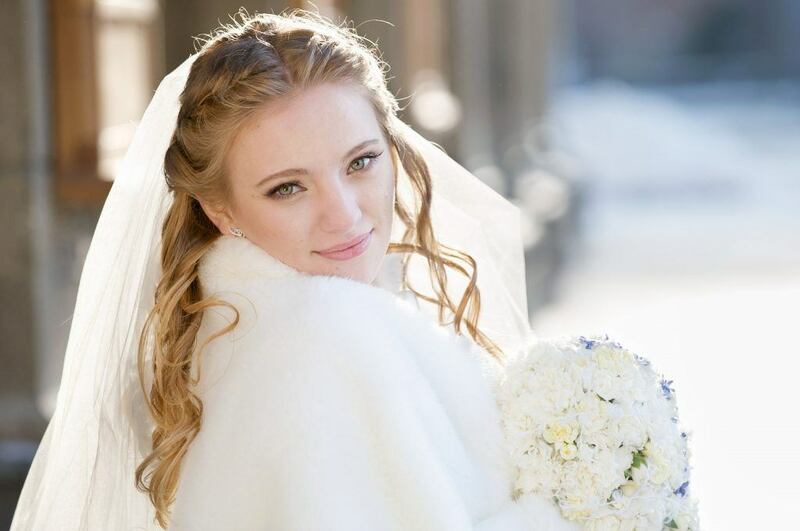 When you consider the nip in the air and the blanket of sparkling white snow, there could be no better backdrop for cozying up to the one you love and exchanging your forever vows. Whether you plan your wedding close to the holidays or after the start of a fresh new year, choose one of these four winter outdoor wedding venues for your rendezvous, and there will be no stopping the romance. If your dream wedding takes you out on the water, Lake Tahoe Cruises has the perfect venue for your winter wedding! 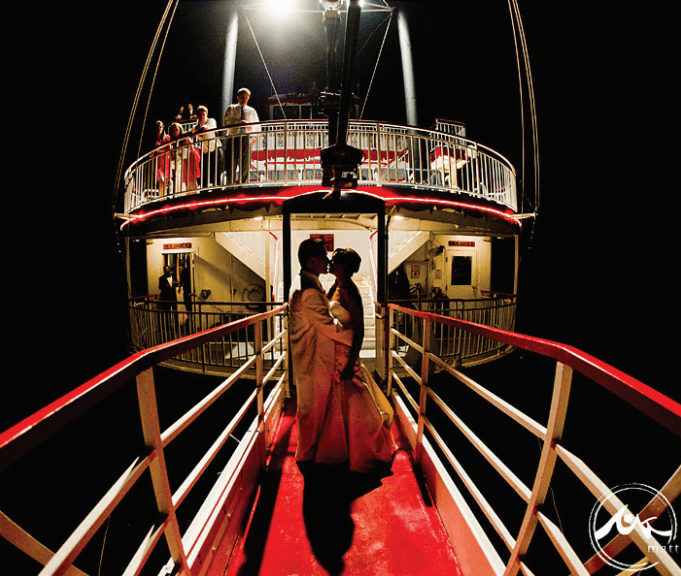 Imagine a romantic ceremony and reception on board the Tahoe Queen, a gorgeous classic paddlewheel boat that’s been a fixture on Lake Tahoe since the 1980s. Or an elegant, intimate affair on board the Tahoe Paradise, an 82-foot luxury yacht with character and class. With the beautiful snow-capped mountains in the background and the crystal blue waters of Lake Tahoe surrounding you, your winter wedding on the water will be an event to remember. Do your wedding dreams involve a snow-covered beach? Zephyr Cove Resort is the ideal place for your winter destination wedding and reception. With heart-stopping views of Lake Tahoe and its surrounding snow-capped mountains in the background, Zephyr Cove Resort offers wedding and ceremony options (and photo opportunities) like no other. Invite your guests to stay at the fairytale-like cabins at Zephyr Cove Resort, and extend your winter wedding to a wedding weekend. 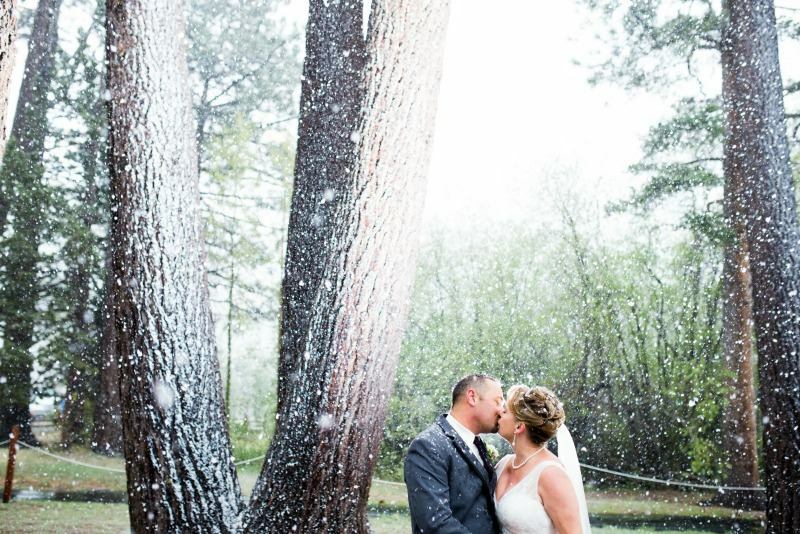 Edgewood Tahoe is a place of mythical beauty and one of the most picturesque winter outdoor wedding venues in South Lake. Majestic snow-capped mountains covered in tall, proud evergreens surround the property, which itself features several elegant indoor spaces fit for the likes of kings and queens. The resort’s two banquet halls offer gorgeous, spanning views of the lake and grounds, which ensure your event retains an outdoor feel regardless of the weather. Perfect for larger events, the North Room accommodates up to 250 people. Edgewood’s South Room is a cozier space—ideal for elegantly intimate ceremonies. Situated on the banks of Lake Tahoe, Edgewood is one of the best places to take in the Tahoe sunset. What could be more perfect for your winter wedding than sunset photos on a snow-covered beach? Want your family and guests to experience everything a South Lake Tahoe weekend has to offer? The Ridge Tahoe does winter right, with special touches throughout your wedding. How about a warm mug of Belgian hot cocoa with a peppermint stick for your wedding guests as they arrive? You can work with wedding staff at The Ridge Tahoe to create the cozy outdoor wedding and indoor reception of your dreams. Turn your event into a wedding weekend and allow everyone to experience the true fun of South Lake Tahoe! The Ridge Tahoe offers ski-in/ski-out access to Heavenly Ski Resort, with hot tubs waiting for you when you return. Ready to plan your dream winter wedding? 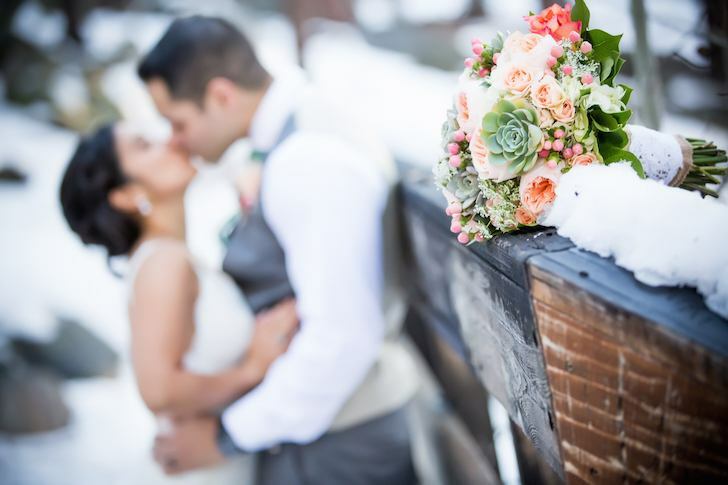 Choose South Lake Tahoe and turn your wedding day into a winter getaway to remember for your family and guests.